On September 29th, 1927 a special meeting was held by the Board of Directors of the Long Beach Chamber of Commerce. At this meeting the Board's Executive Vice President, J. David Larsen, first presented the idea for an exposition that would be different in many ways. Unlike many previous expositions, the Long Beach celebration would not commemorate any particular event. Its sole purpose would be to promote the material development, industrial achievement, and commercial & cultural progress of California's Pacific Southwest. A sixty-three acre tract of land, on the city's waterfront, was selected as the site for the Pacific Southwest Exposition, which would open on July 27th, 1928. After several months of organization and planning, construction of the $650,000 exposition began in May of 1928. The exposition was to be unlike any other, with the main group of buildings designed in a Tunisian-style, and grouped around two large courtyards. This miniature city was approached by heading west on Seventh Street, where the exposition's plain white exterior walls could be seen from downtown Long Beach. After reaching the exposition's parking-lot, a central pavilion with a large archway and Persian-style dome formed the entrance to the main complex of buildings. After passing through this imposing entrance, a lushly-planted garden-court, containing lawns, palms, and shrubbery, greeted the visitor. This court, paved with gravel walks, was surrounded on three sides by a Moorish-style arcade, topped with a roof of mission tile. Upon crossing the garden, and passing through the arcade on the court's west side, a more spacious court appeared. This second main court contained a large rectangular pool at its center, named the Pool of Reflections. 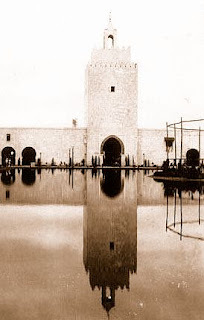 At the center of the pool was a bandstand, and overlooking the court was the imposing Muezzin Tower, where daily "calls to prayer" were issued by a costumed Arab. 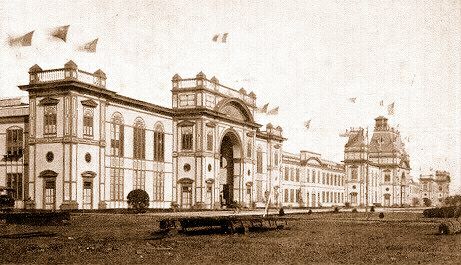 Surrounding both courts were the exposition's main exhibit palaces: the Palace of Fine Arts, Palace of Education & Liberal Arts, Palace of Textiles & Modes, Palace of Transportation, California Building, and the large Palace of Industry. Located south of the main group of palaces was the Avenue of Nations, where buildings of many architectural styles contained exhibits from twenty-two countries. On the west side of the Palace of Industry was situated the Amusement Zone and an 8,000-seat open-air theatre. The north side of the grounds contained an athletic stadium and the Ship Cafe, which occupied the interior of a large schooner moored on the waterfront. The entire exposition was constructed in 10-1/2 weeks, and despite the solid outward appearance of its structures, they were all built of wood, and covered with plaster-board and stucco. Roofs of the main exhibit palaces were all of tightly-stretched white canvas. Towers, arches, columns, doorways, windows, and balconies were designed to cast deep shadows upon the plain exterior walls, similar to an actual Tunisian city. Large copper pots, containing burning incense, were placed in various locations; and eight small tiled fountains were located along the the inner walls of the main court. Costumed international entertainers roamed throughout the grounds; and at night the exposition buildings were illuminated using a rainbow of multi-colored flood-lights. By the time it closed on September 3rd, approximately 1,100,000 persons had visited the highly successful, 5-1/2 week-long, Pacific Southwest Exposition.